This spring, heroes will rise and titans will fall. Top League of Legends talents will have the chance to test their mettle against the best teams in the country. Remember, champions are not born. They are forged. As our inaugural split of the UK League Championship draws to a close, it’s time to turn our attention to what’s to follow. And for fans in the UK and Ireland, there’s another terrific League of Legends competition to enjoy after this weekend’s UKLC Playoffs: Forge of Champions. Forge ran for the first time last year, when we pitted the biggest local organisations against each other for a chance to prove themselves worthy. 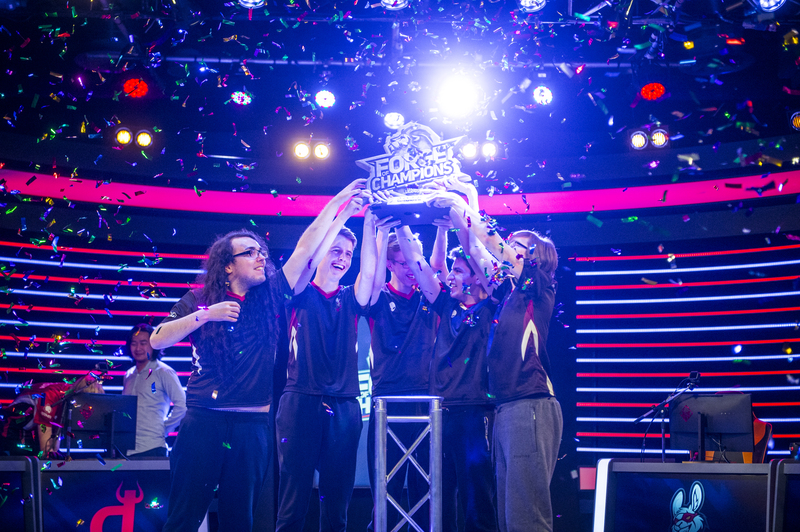 In 2019, the same idea will apply, as amateur players will be able to battle the best UKLC teams. A £10,000 prize pool will be on the line at the Main Event. And the best squads will have a shot at joining the UKLC themselves, in the Promotion Tournament! Read below for more details, such as the criteria for signing up and how the format will play out. Forge of Champions Spring 2019 will start with two online Open Tournaments, where amateur teams and individuals can sign up to play. Then, the top four teams from qualification will join the nine UKLC teams in the Main Event, which is essentially a giant cup! Finally, the four amateur teams will enter the Promotion Tournament alongside our bottom two UKLC teams, and battle to take their spots in the UKLC Summer Split. Forge of Champions will feature two Open Tournaments, which will each result in two qualifying teams, for a total of four. Each online qualifying tournament will be composed of a maximum of 128 teams that will face each other in a do-or-die, best-of-1 knockout bracket. The top two from each Open will proceed to the Main Event. Didn’t qualify from the first Open? Don’t worry—you can still play in the second. Check below for more information on sign-up eligibility and the official Open Tournament rule book. In the Main Event, every match is a best-of-3. The four teams that qualify from the Open Tournaments will be seeded according to their results, and will face the teams that finished 6th-9th in the UKLC league table. The four winners of those matchups will move on to face the 2nd-5th UKLC teams in the quarterfinals. The team that makes their way through the quarterfinals, semifinals, and final will move on to the Grand Final—against the #1 UKLC team, Fnatic Rising! The winner of the Grand Final will walk away with the Forge of Champions trophy and the lion’s share of the prize pool. The Promotion Tournament will start with all four Open teams playing best-of-1 matches in a seeded double elimination bracket. There will be no Grand Final—instead, the winners of the Upper Bracket and Lower Bracket Final will each go through to the next stage. It’s simple—win two games and you’re through, lose two and you’re out! The two teams that make it will play against the bottom two UKLC teams in best-of-3 games following the same format. This time, the two that make it through will earn qualification to the UKLC Summer Split! Both the Main Event and the Promotion Tournament (with the exception of the 14th of May) will be streamed live at twitch.tv/lvpuk. Forge of Champions Spring 2019 is open to the public. Fit these criteria? Grab your mates and join in the fun! Teams must be based in the UK or Ireland: at least 3 starting players in every match must be residents of the UK or Ireland. Teams must have between 5 and 10 players. Players must be at least 16 years old at the start of the competition. Players must have an account on the European West (EUW) server. Players must have all the necessary champions to play a custom game in ‘Tournament Draft’ mode. Players must not be part of any European Regional League (ERL) or any other professional League of Legends official tournament roster, even as a substitute. Players must register online—more details to follow. For more information on signing up, the format, and prizes, you can check out the full Forge of Champions rule book online. Eager to play? Stay tuned to our Facebook, Twitter, and website for more updates and announcements on Forge of Champions, as sign-ups will open soon! Want to watch? Catch our UKLC Playoffs and make sure you’re ready for Forge of Champions by following our channel, twitch.tv/lvpuk.